This one na real lobatan o, lol. NICE IDEA ANYWAY. 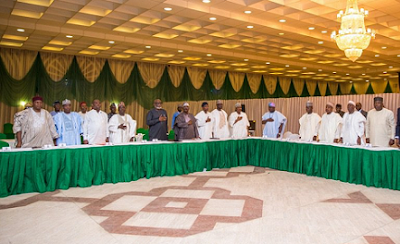 If one no do, another go do... Governors of Nigeria’s 36 states have asked the federal government to hand-over federal roads in their domains for prompt rehabilitation. The demand was announced Thursday by the governor of Ebonyi State, Dave Umahi, at the end of the monthly meeting of National Economic Council, NEC, which held at the presidential villa Abuja. Mr. Umahi said the failure of most federal Roads in the country was of concern to governors. Mr. Umahi said NEC has “recommended release of some federal government roads to state governors for prompt rehabilitation”. He also said the NEC directed the Minister of Power, Works and Housing, Babatunde Fashola, to come up with modalities that will reduce pressure on the roads in order to preserve their quality.